UPDATED 4 P.M. EDT (U.S.A.) Former members of AdSurfDaily who lost money in an alleged $100 million Ponzi scheme are not the only prospects being targeted by affiliates of MPB Today. Recipients of federal benefits administered by the U.S. Department of Agriculture (USDA) also are being targeted. If you receive federal assistance for food — and if you’re turned off by the shipping costs charged by an online grocery store that is part of a 2×2 cycler matrix operated by a MPB Today, a Florida-based, multilevel-marketing (MLM) program — you should use the high shipping costs as a reason to join the MLM program, according to an MPB Today affiliate. And if you are a Food Stamp recipient who needs one more reason to join MPB Today, you should consider that, if you cycle and earn a Walmart gift card from MPB Today, you can use the “gift cards to purchase Walmart Visa Cards, which can be used the same as cash,” according to the affiliate. Under the MPB Today affiliate’s plan, a Food Stamp recipient with a $200 order would be spending up to $300 to gain the same purchasing power offered by a local, walk-in grocery retailer — assuming the local retailer’s prices were the same as MPB Today’s. If the local retailer’s prices were lower, the Food Stamp recipient would lose even more purchasing power. On average, only about 14 percent of participants “earn” money in 2×2 cycler programs. One such program operating in the Seattle area came under investigation last year by the U.S. Secret Service. Walmart did not respond immediately to a request for comment from the PP Blog. The Food Stamp program, known as SNAP, is administered by USDA and managed by the U.S. states and territories. USDA did not immediately respond to a request for comment from the PP Blog. It was not immediately clear if the agency knows about the MPB Today program and the manner in which it is being marketed to Food Stamp recipients. The MPB Today affiliate’s pitch provided no guidance on whether Walmart gift cards could be viewed as reportable income for tax purposes and Food Stamp eligibility purposes. The pitch also did not disclose that the affiliate was in position to earn money if Food Stamp recipients joined MPB Today through the affiliate link on the Blog. A promo on MPB Today’s website encourages visitors to “Eat Well Today!” The site shows photos of delicious food, while prompting visitors to click on a video. The video is a sales pitch for the MLM program. When visitors click on the video prompt, a dire drum beat begins. The word “foreclosure” flashes on the screen twice in the first 15 seconds. Florida has one of the highest foreclosure rates in the United States. 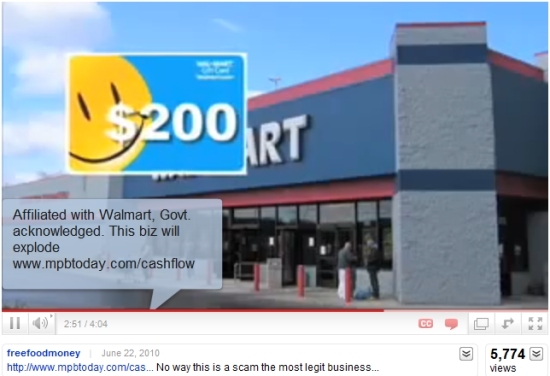 This YouTube promo for MPB Today claims Walmart is affiliated with the program and that the program is "Govt. acknowledged." “This biz will explode,” the video claims. It does not list a source to substantiate the claim that Walmart is “affiliated” with MPB Today and that the government has “acknowledged” the program. The video has received nearly 5,800 views. See earlier PP Blog column. Individuals must report their MPB “income” as Other Income on their 1040, under the category of illegally obtained income (that’s a real category). Failure to do so compounds the crime — in addition to participating in, and benefitting illegally, from a pyramid scheme those people would also be liable for tax evasion (ask Renner). I’m still trying to do the math, where does all this free money come from if you get a $200 card when you send them $200 to start. I watched a video of a guy showing us how he made money, cashed it out at the bank, plus went to Walmart and used his “Gift Card”. Is it like ASD, wherein they had a $2.25 debt for every dollar they took in? I’m not a mathematician; maybe Gregg or someone can answer this mind gobbling question…. Entertained: Individuals must report their MPB â€œincomeâ€ as Other Income on their 1040, under the category of illegally obtained income (thatâ€™s a real category). Failure to do so compounds the crime â€” in addition to participating in, and benefitting illegally, from a pyramid scheme those people would also be liable for tax evasion (ask Renner). I’m still hoping to get USDA and Walmart’s take on this “program.” I do believe you’re reading the tax issues correctly. In viewing various pitches for MPB Today — including the pitches on the Ponzi forums — I am struck by how promoters seem to be licensing themselves to use Walmart’s name. Now, the Food Stamp program’s name is being used. I cannot imagine that Walmart will be thrilled to see its name tossed around on the Ponzi boards. At the same time, I can’t imagine Walmart being thrilled when MPB Today affiliates plant the seed that gift-card recipients should use the money to purchase Walmart Visa cards. I think it’s possible that such practices by MPB Today affiliates could bring money-laundering issues into play — and that affiliates are using Walmart’s name to sanitize the scheme. Thanks for your Comment, Entertained. P.S. I wouldn’t be surprised if USDA takes a dim view on pitching a 2×2 matrix cycler to Food Stamp recipients. Households receive food stamp benefits which varies according to household size and income. The maximum allotment for a household’s size is reduced by 30 percent of the net income. Food stamp benefits may be used in participating retail stores to buy food for home consumption and garden seeds and plants to produce food for personal consumption. Funny, but I didn’t see any mention of being able to use them to pay shipping charges… food stamps or SNAP seem to be for the purchases of “food”, not freight! Households receive food stamp benefits which varies according to household size and income. The maximum allotment for a householdâ€™s size is reduced by 30 percent of the net income. Food stamp benefits may be used in participating retail stores to buy food for home consumption and garden seeds and plants to produce food for personal consumption. Funny, but I didnâ€™t see any mention of being able to use them to pay shipping chargesâ€¦ food stamps or SNAP seem to be for the purchases of â€œfoodâ€, not freight! Thanks for sharing that info. Readers are apt to find it useful. The “Food Stamp” pitch for MPB Today noted in the story above did say that Food Stamp recipients would have to pay separately for shipping from a non-Food Stamp source. So, I just want to be clear about that. The implication was not that Food Stamps could be used to retire the shipping costs. Regardless, Food Stamp recipients still were being encouraged to spend, say, $300 for $200 worth of groceries. I don’t know if the grocery purchase with Food Stamps can be constructed in such a way as to “enter” the individual into the affiliate program. If it turns out that Food Stamp money somehow can be used to pay to enter the affiliate program, well, USDA might have something to say about that. Are the shipping costs really that high? Walmart’s web site says that the cost depends on the size & weight of the goods. I found a story from 2009 that said a $120 purchase would cost $2.10 to ship within the US. That is a lot less than “25-50%”. OK. Pensacola-based Southeastern Delivery, which is in the grocery business, is the purported parent company of MPB Today. The affiliate claim that Southeastern has the “sole right” in the area to accept the EBT card for Food Stamp transactions is dubious. I checked Southeastern’s Zip Code — 32504 — against the USDA database, and the database says at least 25 retailers in the immediate area can accept the card. They are all a very short distance from one another — less than 3 miles and often closer than that. Tony H: Are the shipping costs really that high? Walmartâ€™s web site says that the cost depends on the size & weight of the goods. I found a story from 2009 that said a $120 purchase would cost $2.10 to ship within the US. That is a lot less than â€œ25-50%â€. MPB, the apparent child of Southeastern Delivery, which is in the grocery business, says the shipping costs can be up to 50 percent of the order. Perhaps that is why some affiliates are suggesting that the high costs are the reason to join the program — on the theory that raising the shipping-cost issue somehow helps recruit MLM affiliates, not grocery customers. They scare grocery customers with the high shipping costs, and then plant the seed that you always can just join the affiliate program, get yourself qualified for a Walmart gift card, and buy your groceries at Walmart, thus avoiding Southeastern Delivery altogether. There also is talk about Southeastern shipping groceries free (absent shipping costs) to affiliates. Join the program. Avoid the hefty shipping costs. Some of the MPB Today affiliates have produced check waving videos and web posts. I saw one that shows the name of Southeastern Delivery LLC — not MPB Today — on a check sent to an affiliate. The check was drawn on Gulf Coast Community Bank of Pensacola. It was dated July 9, 2010. An image of a Walmart gift card appeared below the image of the check. I’ve also seen at least two .org websites selling MPB Today. This, of course, plants the seed that MPB Today somehow is a charity or affiliated with a charity. Reps for Narc That Car did the same thing, while also dangling the name of the AMBER Alert program. It is disturbing that the hype mlm industry is moving out of health products into something even more fundamental to most people – food. In a time of economic hardship for many, the carrot offered to future affiliates (forgive the pun) of making money and somehow saving on food bills is too attractive for many people to ignore. It is also highly likely that many people targetted by MPB will not even be aware if the network marketing “industry” and take it on its face value. Without being a genius at math,and in the absence of evidence of a retail market, it is difficult to see how any benefits to members can be funded by anything else than recruitment of more members who pay into the scheme. Its product seems to be of dubious value without an “opportunity” attached. It is to be hoped that people use their common sense and do not fall for the hype and part with their much needed food bill money on this scheme. .
One of the Walmart stores is three-tenths of a mile from the address Southeastern Delivery uses, according to Google Maps. If MPB Today is buying the Walmart gift cards in Pensacola, one of the Walmart stores in the area perhaps is selling lots of gift cards to a single customer. admin: MPB, the apparent child of Southeastern Delivery, which is in the grocery business, says the shipping costs can be up to 50 percent of the order. I’m still wondering where the 50% shipping costs come from. Delivery fee is $12.50 for orders $60-$250 or 10% above $250. That is nowhere near %50. Tony H: Iâ€™m still wondering where the 50% shipping costs come from. I’m thinking the numbers Southeastern cites on its website are for local orders in the Pensacola area, Tony. The MPB Today site uses different numbers: 25 percent to 50 percent, and the presumption appears to be that the groceries will be shipped outside the Pensacola area. I am an affiliate of MPB and I can tell you (just like with any program) there are idiot affiliates out there, that will lie and try to cheat their way with gaining other affiliates. When you sign up with MPB you have to acknowledge and check off the Terms of Conditions that states that MPB is in no way shape or form affiliated with Walmart. Also you have to give your fed tax ID # and once you make over $600 you will get a 1099. thirdly EBT cards Are NOT accepted to become an affiliate. you can use it if you live in the delivery area of Southeastern foods. I can try to help answer other questions if you have them. I had posted a simple question earlier to Megan, but she has not answered. As you are aware, there have been concerns over the 2×2 comp plan for MPB. It is extremely easy to naigate into an illegal pyramid scheme with this kind of structure, so I will ask you the same simple question. It has been stated several times that once a person cycles through the matrix, they receive the equivalent of $500. Where does the money come from in order to pay that $500? Entertained: Where does the money come from in order to pay that $500? And how many people can sign up for the “2 X 2 matrix” before MPB runs out of potential customers in the USA ??? Is there any way of a new prospect verifying exactly where they sit in the structure before he or she signs up ??? IOW, someone signing up on level 1 or 2 has a far greater market of unapproached prospects than someone who is 10 or 20 or 30 levels down the chain, so how does someone ascertain where they stand in terms of potential market ??? The “wheat and chessboard” theory ROOLS, ok ??? littleroundman: The â€œwheat and chessboardâ€ theory ROOLS, ok ? It also works in reverse. If you think of how many people are at the bottom of the pyramid who have paid their $$$$, and have no chance of getting paid. At the lower levels, much more money gets paid to the pyramid operators than gets paid out. Entertained: Thanks Matt,I had posted a simple question earlier to Megan, but she has not answered.As you are aware, there have been concerns over the 2Ã—2 comp plan for MPB.It is extremely easy to naigate into an illegal pyramid scheme with this kind of structure, so I will ask you the same simple question.It has been stated several times that once a person cycles through the matrix, they receive the equivalent of $500.Where does the money come from in order to pay that $500? Quite simple, a cycle means that there has been $1200 in sales (your 2ppl, and their 2 ppl = 6 ppl @ $200 a person) You get paid $300 Check and a $200 Walmart gift card = $500. As far as the structure is concerned the “top” ppl dont always make the most, we have numerous ppl in our organization that have cycled more than the ppl above them. And also as far as potential People coming into the business, as of right now there are only 20k ppl in it, so the Market is wide open for growth. My wife and I joined about a month ago bc we really needed this, to suppliment our loss of income due to the economy, and it has really saved our hind in, as far as covering bills and buying gas and groceries. OK, but those 6 people also get their $200 in groceries, correct? Thus, the cash outflow = $1200 in groceries, plus the $300 check, plus the $200 Walmart gift card. Seems to me that there is a $1700 outflow, and only a $1200 inflow. Where does the extra $500 come from? Matt: Quite simple, a cycle means that there has been $1200 in sales (your 2ppl, and their 2 ppl = 6 ppl @ $200 a person) You get paid $300 Check and a $200 Walmart gift card = $500.As far as the structure is concerned the â€œtopâ€ ppl dont always make the most, we have numerous ppl in our organization that have cycled more than the ppl above them.And also as far as potential People coming into the business, as of right now there are only 20k ppl in it, so the Market is wide open for growth.My wife and I joined about a month ago bc we really needed this, to suppliment our loss of income due to the economy, and it has really saved our hind in, as far as covering bills and buying gas and groceries. Entertained: OK, but those 6 people also get their $200 in groceries, correct?Thus, the cash outflow = $1200 in groceries, plus the $300 check, plus the $200 Walmart gift card.Seems to me that there is a $1700 outflow, and only a $1200 inflow. Where does the extra $500 come from? You can either redeem the $200 for groceries OR redeem for a $200 walmart gift card, its either/or not both. I am confused. Are you saying that for your $200, you get nothing until you cycle in the matrix, and then when you cycle, you get the equivalent of $500 ($300 check and $200 in groceries or a gift card)? Thanks…. Matt: You can either redeem the $200 for groceries OR redeem for a $200 walmart gift card, its either/or not both. Entertained: Matt,I am confused.Are you saying that for your $200, you get nothing until you cycle in the matrix, and then when you cycle, you get the equivalent of $500 ($300 check and $200 in groceries or a gift card)?Thanksâ€¦. You can order Groceries as soon as you sign up OR you can wait till you cycle and redeem it for the Gift Card. 1. Punter pays $210 gets $200 voucher company has $10 profit. 2. Punter ropes in 2 suckers, each pays $210, each gets voucher, company has now $10+ 2*$10 = $30 profit. 3. Each sucker then has to drag in 2 numpties, each pays $210, each gets voucher, company now has $10 + 2*$10 + 4*$10 = $70 profit. At this point, the lucky punter “cycles” and gets $300. Hooray! It’s real, it’s paying, we are all naysayers. Except to pay that $300 the company has only $70. So where does the other $230 come from to pay the $300 owed? Or does the punter get $300 and a $200 voucher? If so, the debt is higher and $500 is owed, not $300. This is where the “loss leader” excuse comes from. 2×2 matrix, getting nothing until you cycle, right? Do the people who get the groceries up front enter the 2×2 matrix? “It is also highly likely that many people targeted by MPB will not even be aware if the network marketing â€œindustryâ€ and take it on its face value. Without being a genius at math, and in the absence of evidence of a retail market, it is difficult to see how any benefits to members can be funded by anything else than recruitment of more members who pay into the scheme. Its product seems to be of dubious value without an â€œopportunityâ€ attached. Hello everyone! I am one of those who got sucked up into this financial pyramid scam called the MPB Today! Entertained! NO, you did not get entered into the 2 by 2 matrix if you order your grocery as soon as you signed up! So…I am the one who jumped up on this scam thinking wow! What an opportunity to save on my grocery bill! I signed up and signed bunch of my relatives and friends :-( ….then I started asking questions to the MPB customer department, the same questions that some of the members here asked. The video clearly says: If you want just to buy grocery, DON’T bother! You can go to the local store and buy the same groceries and never pay the shipping charges! I wrote an email again…please show me the legal documents that prove that your company is not a pyramid scam! Nobody is selling or buying anything in up line or the down line, but people get paid! It is a financial pyramid and it is illegal in the US! No answer! I called the number provided by Gary, who invited me to join the company conference call, and got into an interesting conversation with a woman, who finally LOST IT and called me a stupid, “illegal immigrant yourself”, (I have an accent), who only deserves to work at MacDonald’s and that is where I belong to, and then she hang up on me! WOW! I wrote to the MPB twice, describing this matter and asking for the proper business documents again! I got an “educational” email from them that I did not responded back with my educational email… yet! THIS IS the email: There is NO “Hello Olga”! NOTHING! You have total control over you down line. It is actually a benefit to have overflow in your matrix so that you can cycle. The spillover will not show in your genealogy or your down line, because they were not sponsored by you or any that you have sponsored. Therefore, you have nothing to worry about when it comes to controlling your business, it all falls into place. This is NOT a financial Pyramid, this is a Grocery delivery company, that is what we focus on and would prefer that our affiliates do the same; however, we do acknowledge that there are some people out there who are not about the groceries and only want to make money, however, we are not. We use the matrix system to get the word out about our groceries and have plans in process to have grocery hubs all over the U.S.
Where did you see that MPB is an affiliate of another company? If you read the â€œabout usâ€ page, you can see that we are affiliated with Southeastern Delivery in Pensacola, FL. Meaning we are â€œbeing in close formal or informal association; related:â€ not a â€œpart ofâ€. As far as I know of, there are no documents that we have to prove or disprove a pyramid scheme and as you know a pyramid scheme does not offer a product. However, we do have 30,000 affiliates signed up with us that are working the company on a regular basis, to include gaining customers that do, in fact, purchase groceries from the website and delivered by us, MPB Today. This is NOT ALL!! TODAY! The MPB associate had guts to call my up line and asked her point blank to call my down line. She told my sponsor that my down line causes them trouble and that my sponsor should stop her from disputing the $210 charge that my down line filled with her bank! Well, I filled mine disputes too! I guess the MPB Today will be calling around a lot! If this business is legal, why would they call my up line and ask for help?! Thank you for sharing your experience. Yes, I do know how the 2×2 works and where the money comes from, and have all along. You have correctly identified it as well. The math is pretty straightforward too. 86% of the people who enter the matrix will lose money. It is a guarantee. The simplest analysis shows that the one person at the top of the cycle gets paid by the 6 people immediately below that person. Thus one person gets paid, but the other 6 pay in. So, for cycle 1, 1 person out of 7 gets paid, translating to 86% (6 out of 7) do not get paid in cycle 1. In cycle 2, the next 2 people get paid, but 8 more people have to join in order for the cycle to occur. Each of the two people who get paid need 6 people in their downline to not get paid for that cycle in order for them to get paid. This repeats indefinitely, until either the matrices stop cycling because of lack of interest/ability to find new people to join the pyramid, or (if MPB is wildly successful) everyone on the planet joins. Problem is, eventually there IS a last cycle, and in the end, there will be those 6 people unpaid for every one that does get paid. Math is a cruel thing — it is completely unbiased and exposes the MPB pyramid for what it is……. Olga: â€œIt is also highly likely that many people targeted by MPB will not even be aware if the network marketing â€œindustryâ€ and take it on its face value. Without being a genius at math, and in the absence of evidence of a retail market, it is difficult to see how any benefits to members can be funded by anything else than recruitment of more members who pay into the scheme. Its product seems to be of dubious value without an â€œopportunityâ€ attached.It is to be hoped that people use their common sense and do not fall for the hype and part with their much needed food bill money on this scheme.â€ Hello everyone! I am one of those who got sucked up into this financial pyramid scam called the MPB Today! Entertained! NO, you did not get entered into the 2 by 2 matrix if you order your grocery as soon as you signed up! Soâ€¦I am the one who jumped up on this scam thinking wow! What an opportunity to save on my grocery bill!…..snip…. So MBP is illegal? What about all of the other MLM or newtwork marketing companines out there. Some of these have been around for years. It’s no different than an insurance company that issues health insurance. They charge ridiculous premiums banking on the fact that the majority will never file a claim! But what if one year every policy holder had a claim? The insurance company would be broke and would be unable to pay! It’s no different with MLM or Network marketing companies. Only about 5% of people that join these companies every make any money and these companies understand that. So, 95% fail which actually is about the same failure rate of a traditional business. I’ve been in a few of these companies and did not make a dime, but unlike Olga I blame myself. I was excited in the beginning but just did not want to work the business. So you wonder how they can make these payouts when it appears they’ve got more money going out then they do coming in. Its simple, the majority will pay to get in the business and then never receive a dime in return because the will not work the business. Bruce…well put…it got quite once you shed light on the fact that all customers / affiliates / participants are or should be aware that work (sharing with others) is requirement…regardless of the Network many people that are unsuccessful in selling the companies product(in this case “Groceries)seem to cry foul! Fact #1: The $200 purchase is retail price. compared to traditional grocery stores. weight and location, dry goods only. team has accumulated $1200 in Grocery Sales. Fact #10: MPB is one of Walmarts Largest Customers. Fact #12: MPB makes aprox $100 per cycle. any price, much less country wide. very slanted, one sided and fact-less. This is the first time I’ve read articles on you site but if they are anything like this one then patrickpretty.com is a SCAM and just a pure gossip site at best. Patrick, if there is a Patrick should get his facts straight… I’m sure this will never post which will prove my point. If it does..I welcome a rebuttal to each fact above. ps. 100% of the people I referred to this innovative and unmatched “Grocery Deliver System” have made money… In fact there are several people that were referred by people that I referred that have made 10 times the groceries/money/and gift cards that I’ve made because they worked harder than I have. wrong again. Seems like you are reading the wrong reports.